There was a time, in the not too dim and distant past, when considering whether to invest in an ‘ethical’ fund may well have been a similar thought process to deciding whether or not to donate money to a charity. Ethical investing was an option only suitable for the ultra green, ultra ethical, ultra adventurous investor and the thought of ‘doing good’ would have more than likely been a more powerful driving force than the usual fear/greed considerations which we all go through when considering investing our hard-earned cash. Options were limited, confusing and they were notably more expensive. Options depended too much on only a few factors, government subsidies for example. Possible investment issues people can avoid through investing ethically (from top left to right): armaments, intensive farming, extraction of fossil fuels and gambling. I can remember clients coming to me for advice, describing themselves (fairly, in my opinion) as ethical, or socially responsible. When we came to look at the infamous ‘past performance’ of the ethical options I would present them with, in comparison to ‘standard’ funds, the social responsibility and ethics they felt so strongly about suddenly became less of a driving force in their thinking. There were clear ‘danger signs’ all over the place… more volatility, lower returns, higher costs. It was very difficult to advise anyone to put their money into ethical funds, on the basis of performance alone, as opposed to standard funds. Fortunately for ethically minded investors and the world at large, a quite remarkable transformation has taken place in this part of the investment universe. Where previously, there simply were not enough ethical funds available to put together and maintain a portfolio, now we can assemble portfolios of funds which to varying degrees take ethics, corporate governance, sustainability, environmental impact, and social responsibility into consideration when selecting the stocks which drive performance. 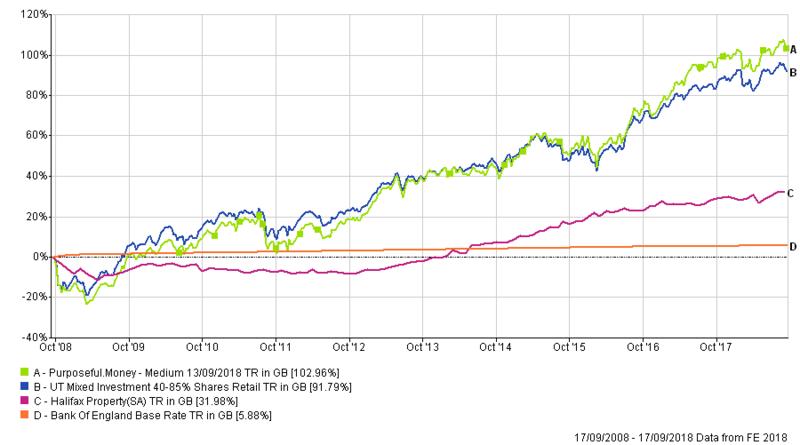 The chart below gives a good illustration of what an ‘ethical investor’ could have achieved over the last ten years. We’ve used the Bank of England Base Rate, and the Halifax Property Index as well as our own ‘Medium Risk Portfolio’ and benchmark to give some context. It is important to point out that none of this data should be in any way relied upon as a guarantee of similar future performance, but it gives a clear illustration that investing ethically does not necessarily mean compromising on risk or giving up a good return in the way that it previously did. Your money can be put to good use for yourself and for the wider world. Comparison of our own ‘Medium Risk Portfolio’ (Green) and benchmark, with the Bank of England Base Rate and the Halifax Property Index (2008-now). As more and more people become aware of the problems facing society and our environment, demand is increasing for ethical solutions to all aspects of our day to day lives. Investments and pensions are no different. This is driving more and more fund houses and wealth managers to either bring these concerns into their existing fund processes, or to launch new funds to meet demand. We expect ‘ethical’ investing to become mainstream within the next few years, and there is certainly no longer a need for us to equate ‘doing good’ with sacrificing returns. Our portfolios are now 100% divested of fossil fuel extraction and exploration companies, something we could never have achieved even a couple of years ago. Your pension or ISA can now be ‘doing good’ for yourself and for the wider world. We've got experts on hand to answer your investment queries. Get in touch. – that’s why unlike other IFAs we won’t charge you hundreds or several thousands in initial set up costs. We have no initial setup fee. Purposeful.Money have achieved Chartered status, see what this means to you below. We’ll always respect your privacy. We’ll never send you anything unpurposeful. Purposeful.Money Ltd is authorised and regulated by the Financial Conduct Authority. The Financial Ombudsman Service (FOS) is an agency for arbitrating on unresolved complaints between regulated firms and their clients. Full details of the FOS can be found at the website at www.financial-ombudsman.org.uk. Purposeful.Money Ltd is registered in England and Wales, company registration No 00985150. The guidance and/or advice contained in this website is subject to the UK regulatory regime and is therefore restricted to consumers based in the UK. Past performance is not a reliable indicator of future returns. You should be aware that the value of an investment can fall as well as rise and that investors may not get back the amount they invested. @Copyright 2017. Purposeful.Money. All rights reserved.